The Accra Metropolitan Assembly (AMA) has begun a special exercise to take street children and beggars off the streets of Accra. The exercise which is in collaboration with La Dadekopton Municipal Assembly (LADMA) began on Thursday 25 May 2018. The AMA has so far picked up 200 persons including children believed to be from Niger and Nigeria from some ceremonial routes, streets, under bridges, and in traffic, begging for alms from benevolent individuals. Areas covered include Movenpick Hotel, Trade Union Congress (TUC), Cathedral, 37 Military Hospital, Airport City, Airport Junction and Accra Mall, Spanner Junction traffic light, and the Ghana Standards Board (Shiashie). The Assembly has therefore assured the public that, it is working in close collaboration with the Department of Social Welfare towards the reformation and reintegration of these persons into society. The team also went to Kaneshie overhead bridge, Nima and Maamobi, and at traffic intersections at Sunny FM, Okponglo [Ghana Standards Authority (GSA)] and Graphic Road stretch. 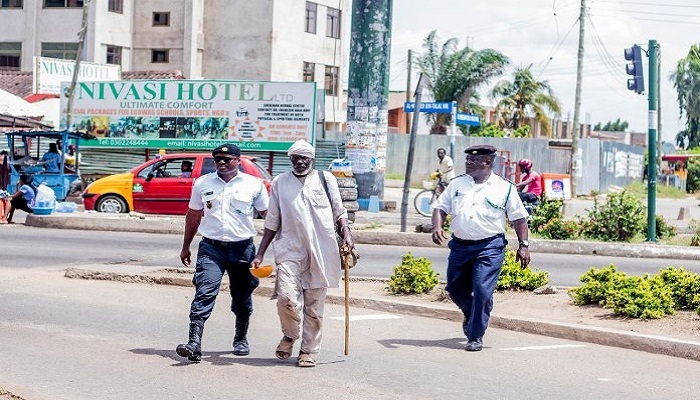 They picked beggars and children at the footbridges at the Tetteh Quarshie Interchange, as well as popular bus terminals like the Neoplan Bus Stop at Achimota, Circle, Kaneshie and the Korle Bu traffic light. The Assembly is therefore urging the public to cooperate and desist from giving money to beggars on the streets as they will be violating the Beggars and Destitute Act, 1969 (PNDCL 392) which criminalises the act of begging and giving to beggars. A few weeks ago, the Gender Minister and Social Protection, Otiko Djaba challenged Metropolitan, Municipal and District Chief Executives (MMDCEs) and officers at the Social Welfare Department to take legal action against parents who compel their children to engage in all forms of child labour.